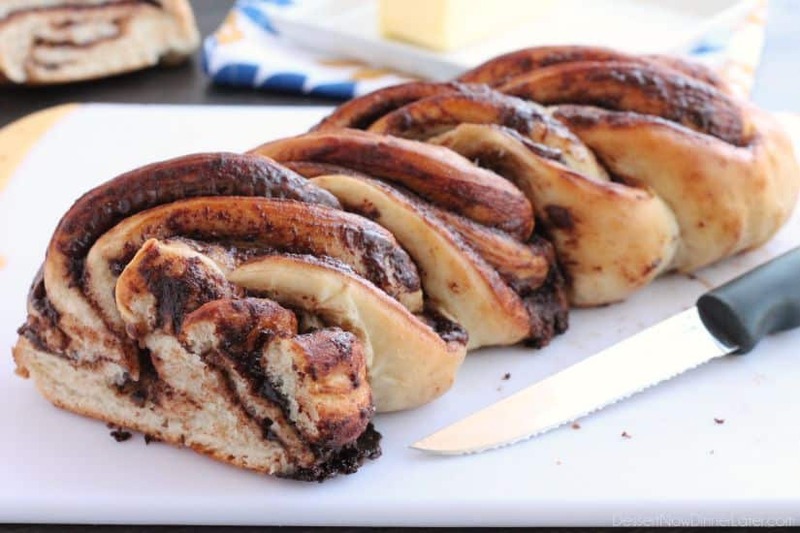 Nutella Twist Bread - Dessert Now, Dinner Later! 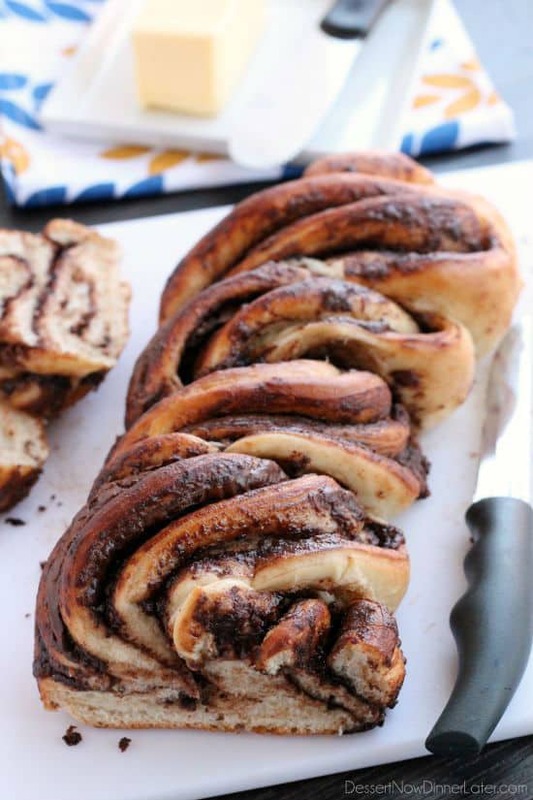 Rhodes frozen dough and Nutella is all you need to make this twisted loaf of delicious bread! Get the step-by-step photo tutorial and make it asap! My family is kind of obsessed with this chocolate-hazelnut spread, called Nutella. If you’re not sure how it’s pronounced, it’s “New-tell-uh”. It’s pretty much the most de-licious spread EVER! I put it on toast, in desserts, and I even dip bananas and oreos in it. Obsessed I tell ya! 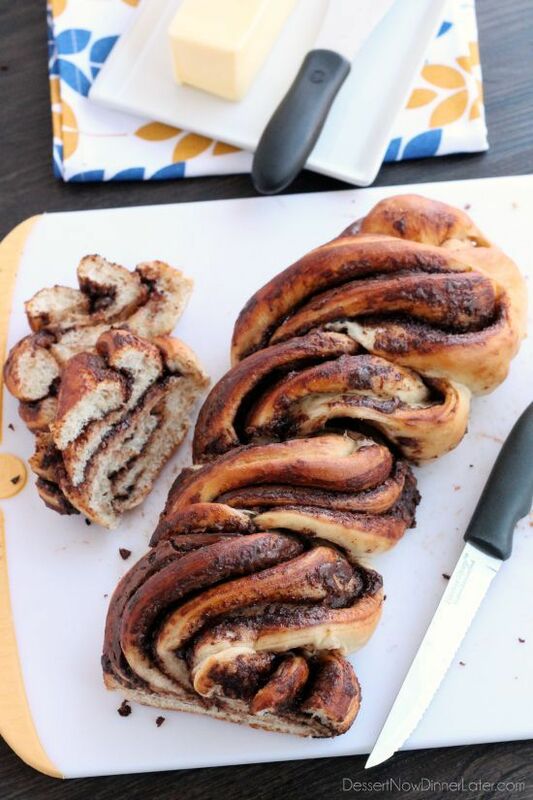 Well, today’s creation is easy enough for the kids to make, but has that “wow” factor because this loaf of bread is swirled with that chocolate-hazelnut goodness that is Nutella. It’s way easier than it looks too, I promise! 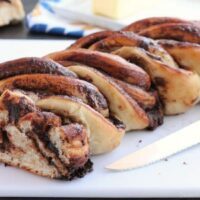 We ate most of this Nutella Twist Bread warm out of the oven, and my oh my is it the best that way! You can also warm a slice or two in the microwave if you have any leftovers. And if you are strong enough to not eat the whole loaf right after it’s baked, then you have more self control than I do! 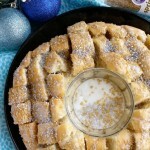 Anyway, grab the recipe from the Rhodes Kids Blog today! I promise, you will be wowed with how easy it is. Make a bunch for holiday neighbor gifts! Yum! Thaw one Rhodes White Bread loaf and set it on a lightly floured surface. 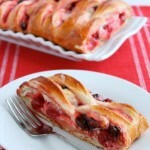 Roll the dough into a large rectangle about ¼-inch thick. Spread ⅓ cup of Nutella in the center of the rectangle, leaving a 1-inch seam on the edges. Warm the Nutella in the microwave for 10 to 15 seconds to help it spread easily. Roll the dough up like you would for cinnamon rolls, from one long end to the other long end. 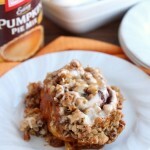 Using a knife, dough cutter, or bench scrape, cut down the center of the roll leaving 1½ to 2-inches in tact on one end. Twist the two cut pieces one over the other until the ends meet. Bake at 350 degrees Fahrenheit for 25 minutes or until golden brown. This bread would be hard to resist! I’m like you, absolutely obsessed with nutella! Heading over to grab the recipe!! 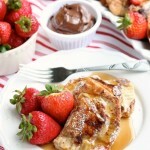 Nutella = Love! Haha. Thanks Jen! This kind of bread (we call it cake here) is super popular in my country. Is it really?! That’s great! Thanks Winnie!